Hi, my name is Adam Stewart, Debt Collection Expert and owner of Debt Recoveries Australia. It’s now accepted, that debt collectors can and do use the internet to find people who owe money. One of the most valuable ways of finding people is through social media sites. We use all the social media sites for skip tracing. Skip tracing is an industry term for tracking down a debtor when you don’t know their current address, phone number, or place of employment. When we have to find someone in order to collect a debt, any information will be used for that purpose, including freely available information on social media sites. Often, we find some debtors are running and hiding. They are wary about what information they make on their social media profile, so they mark it private. This is where we get creative. We might perhaps look at the debtor’s friends on Facebook. We will look at their posts and perhaps glean information about the debtor’s whereabouts, workplace or recent places they have been and who they travelled with. Friends may also have valuable information about assets and income the debtor may have. All this information is freely available. It’s just a matter of being creative and digging a little deeper. As debt collectors, we must abide by the consumer laws and Debt Recoveries Australia also follow the Institute of Mercantile Agents Ltd Code of Ethics. For further information on the laws and guidelines on debt collection through social media, check out my previous blog: How to Collect Debts through Facebook and Other Social Media Sites. While debt collectors are prohibited from harassing the debtors we pursue on social media, there are no rules prohibiting the use of social media for locating or learning about debtors. What a debtor has posted for public consumption on their Facebook, Linkedin or Instagram page, such as contact information, is fair game for anyone to see and use. A new type of debtor is connected 24/7, uses new online channels and new communication tools, trusts in advices made online, buys more online than offline, wants to provide feedback about their product or service, expects good customer service and reads and creates product and service reviews. They also increasingly use comparison websites in order to find out what services other people use and what their interaction was. These debtors are also open to dialogue online. They expect that a service focused company will provide this service online, through chat, rather than old-fashioned forms, such as email and phone. Traditionally, debt collection was done in private, mainly because of the old social stigma of being in debt. So being discreet has suited both sides so far. Today, the ubiquity and transparency of social media starts to tempt both sides with going public. Also, we now know that being in debt can actually be a good thing. Look at the popularity of negative gearing here in Australia. This is basically a process of going into debt, in order to make a loss on your investment, in order to minimise your tax. So going into debt is one of the most popular financial past-times! Along with this new type of debtor, we, as debt collectors, must adapt and provide new ways of communicating with these debtors. 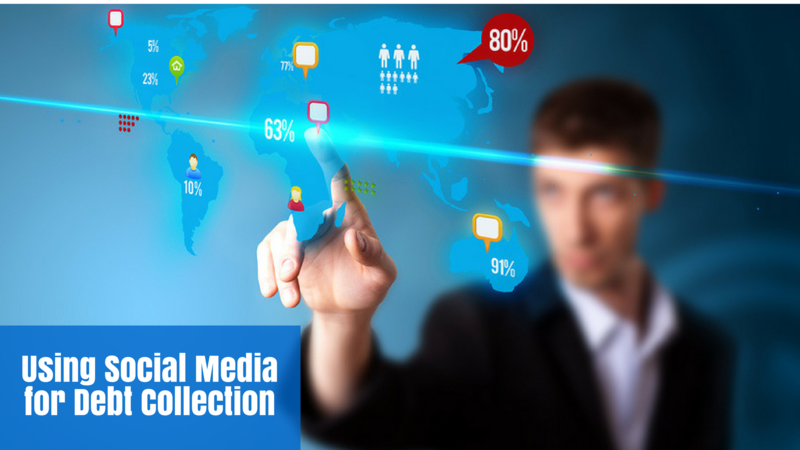 Firstly, I believe each collection agency must have a social media policy in place and practice the highest levels of transparency when it comes to the use of social media profiles and content. We all remember the incident of a major Australian bank, where the staff were caught setting up a fake Facebook account to send messages to debtors. Have a policy on the do’s and don’ts of social media debt collecting and ensure all your staff are trained up and aware of your procedures. Secondly, this new online, connected debtor, will be posting online reviews of service provider companies, such as debt collection agencies. This is already starting to happen. Google is the obvious one, however, there will be comparison sites for debt collectors soon, if not already. The impact we have on these new social debtors, is very immediate. Twitter, Google and FB will provide instant reviews on service and interactions. So be proactive. Talk to your debtors, before they post any negative comments. Provide an online chat forum on your website so they can interact, without having to wait on your phone line or get a response to their email. Have responses ready to go for all the most popular queries and questions from debtors. Have a great customer service system to back up all these systems. Most importantly, once you have these lines of communication open, then listen to your debtor. Hear what they have to say and work with them for that win-win outcome. Happy collecting! Debt Recoveries Australia is the expert at recovering your outstanding debt without the drama. For more information, email at us email@debtrecoveries.com.au or call 1300 799 511. Talk to us about your debt collection concerns via Skype at debtrecoveries.